While in New York on Monday I made some time for a little shopping. (BIG SURPRISE) I had a Saks Fifth Avenue gift certificate from my boss that I decided I would use to replenish my cosmetics that had run out. 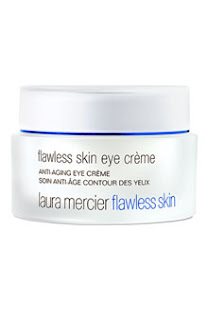 My first stop was at the Laura Mercier counter to purchase my eye cream that I had been out of for about 6 months. I figured it was something to help combat the dry climate that I live in. When I asked for the eye cream I have been using for the past 3 years, the gentleman behind the counter looked me and said, "Well I think that you should really be using our anti-aging formula that helps with lines, wrinkles and dark circles." My first thought was, "Are you kidding do I really look like I need a cream that does all that?" When I hesitated he then said, "All women in their mid 30's need a cream like this." Wow, he thinks I am already in my mid 30's, I didn't have the guts to tell him that I am only 33! So here is what I walked away with! I am sure that within weeks you will all notice how quickly my wrinkles and dark circles have disappeared! We had to adjust our birthday celebration this year to accommodate my New York travel schedule. I had to leave the afternoon of January 27th (her actual birthday). So we celebrated the Sunday before with the Reid side of the family. She specifically requested a white cake with chocolate frosting and sprinkles. We can hardly believe the little girl we brought home to our tiny New York apartment is 4 years old. She has truly been such a joy in our lives. I thought I would at least post some of the fun things we did during the Holidays. Below are pictures of Sydney, Lexi and Austin making a gingerbread house. A week after Christmas it appeared that our gingerbread house disappeared (aka...dad threw it away). That of course did not go unnoticed by Sydney. When she asked me what happened, I quickly told her that the gingerbread men came in the night and took it away. I was sure that would go over much better than the fact that dad threw it away! She then wanted to know what they were going to do with it. I told her they would probably eat it. In December we went with Sydney and some of her cousins to see the Nutcracker Ballet downtown. We decided to make an entire evening of it and enjoyed dinner at Bambarra before the performance. Hello, this is Kyndra and I am the guest blogger. Since Christa's blog has been sadly neglected for the past few months, I have taken it upon myself to update her blog periodically, and she may not even know about it sometimes! Odds are Greg will read the blog before she does and inform her what I have done. Austin, Sydney and Lexi decorated pencil holders with paint, googly eyes, gems and feathers. The finished products! Syd and Lex had on garbage bag aprons, but Austin preferred to show us how macho a 2 year old can be. Sydney's princess throne she got for her birthday was a hit even among the boys, but eventually the rightful heir resumed her proper place. No day would be complete without dancing!